There are two types of travellers– the ones that love to be entertained by man-made structures, and the ones whose definition of a prefect trip is tirelessly exploring the beauty of nature. The first ones have a wide range of options since most countries can boast with historical remnants and impressive architectural feats. However, only a few were able to preserve their natural beauty in pristine condition, unspoilt by humans. The most Northern countries on the American Continent, Canada and Alaska, are the rare places on Earth you can hope to experience majestic natural feats all while having the freedom to be spontaneous and discover plenty of adrenaline-filled experiences. Lonely Planet named Canada the number one destination to visit in 2017, and they sure made the right pick. When one mentions Canada, the first thing that jumps to mind are the grandiose Niagara Falls. Though it might not be the largest in the world, it sure is the most popular – each year giving 12 million visitors a sight to remember. 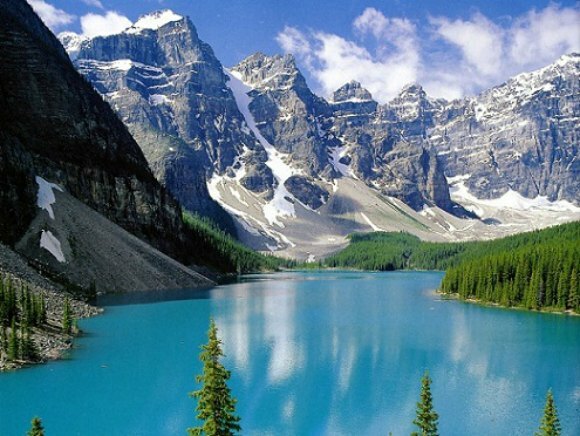 Then, there are the famous Canadian Rockies that can give you a taste of dazzling high peaks, pristine forests and lush meadows. Visit Banff National Park where you can experience vertigo inducing ropes course up Mount Norquay. When you’re done, treat yourself to a relaxing canoe ride all the way through Lake Louise. The Rocky Mountaineer train snakes along the massive entirety of the Rockies, giving a spectacular ride to everyone looking to travel Canada and Alaska. Spread around six time zones and the longest coastline in the world (202,080 km) that touches on three oceans, Canada is one country filled to the brim with the most epic wildlife you can imagine. The minute you leave its cities and wonder off into the forests or remote coasts you are treated by a giant bear hug. Brown bears and grizzlies all cohabit with moose, elks and wolves. And if you’re excited about the prospect of getting face to face with a polar bear, Churchill is considered to be the Polar Bear Capital of the World where sightings of these beasts are pretty much guaranteed. Cape Brenton, the rugged green island off the coast of Nova Scotia, is a wildlife heaven of puffins, kittiwakes, grey seals, black guillemots, white-sided dolphins and humpback whales. If this didn’t inspire you to visit Canada, then perhaps its handsome prime minister will. If you are such a gritty adventurer that even Canada doesn’t cut it for you, Alaska is everything Canada is times 100. An isolated frontier region, challenging, cold, and in many ways the complete antithesis of Australia. The nature is pure and raw, unspoiled by human activity. This aggressive landscape turns magical once the Aurora Borealis drops a colourful curtain above the mountains of snow. A one of a kind experience, for some this is the primary reason to visit Alaska. Unlike a century ago, visitors today get the exclusive chance to climb the highest mountain peak in America, Mount McKinley. And if that doesn’t make your jaw drop, watching ice from a glacier crash into the ocean surely will. Glacier Bay National park is home to the world’s most beautiful glaciers and vibrant marine landscape. The most fearless of adventurers will love to get on a helicopter or a kayak and explore the magnificent ice structures that expand, contract and break apart and seem to have a life of their own. A country that has more lakes than people, an amazing 3 million of them, and around 3000 rivers, Alaska is truly a kayaker’s paradise! For a cold and frozen state, Alaska is booming with a significant amount of unique wildlife. Alaska’s largest island, Kodiak, is home to the Kodiak Brown Bear (the world’s largest bear species). If you’re not bold enough to observe bears in their natural habitat, you can visit the large Wildlife Conservation Centre just 1 hour south of Anchorage where you can see plenty of other native species such as moose and elk. And if you’re travelling through Haines, you cannot miss the world’s greatest concentration of bald eagles who are just waiting to give you a spectacle. If you can’t make up your mind, why not go for both. Due to their close proximity you can travel Canada and Alaska on the same go. Just jump on the Rocky Mountaineer, hitch a cruise, or better yet book one of the pre-organized packages many Australian travel companies offer.